This year is my fiftieth class reunion–Yikes! Where did the years go! But it got me thinking about some of the things that happened in high school. 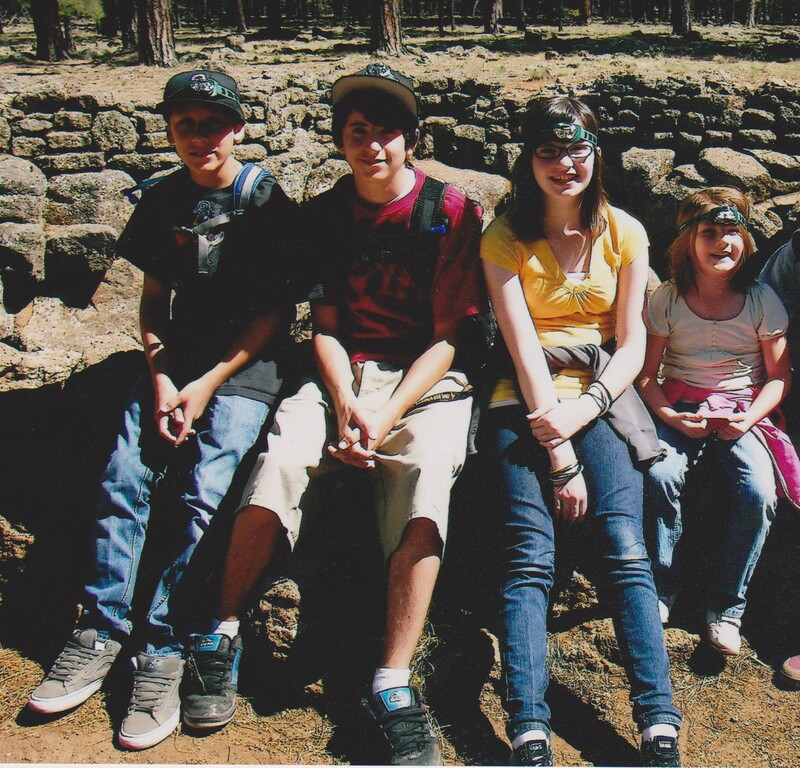 One of my best memories is a trip I took with some friends between our sophomore and junior years. Somehow we managed to convince our English teacher, Miss Diehl, to take us to the Grand Canyon. I’m pretty sure my parents only said I could go because they thought Miss Diehl would turn us down. Thinking back on it, Miss Diehl probably went along with our scheme because she didn’t think our parents would let us go. Anyway, everyone underestimated our powers of persuasion. We spent our first night in Peach Springs, in the teepee motel. The following morning, we left early to take the sixty-mile dirt road to Havasupai Canyon. Somewhere along the way, we had a flat tire. Since the tire was damaged beyond repair, it was necessary to buy a new one once we got to Flagstaff. That seriously cut into the amount of money we had for the trip and required some recalculations. If that wasn’t bad enough, no one had figured how expensive food would be in Havasupai Village. Everything had to be brought in by horseback, including us. The horseback ride was definitely one of the highlights of our trip. Once in the canyon, we stayed in the lodge. The only food we could afford was a large jar of peanut butter and loaf of bread. That was what we ate for our two days in the Canyon. 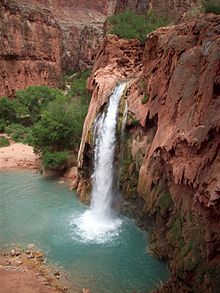 Anyone who has been to Havasupai will tell you that it is like no place on earth. The water cascades down into brilliant blue pools surrounded by red rocks. 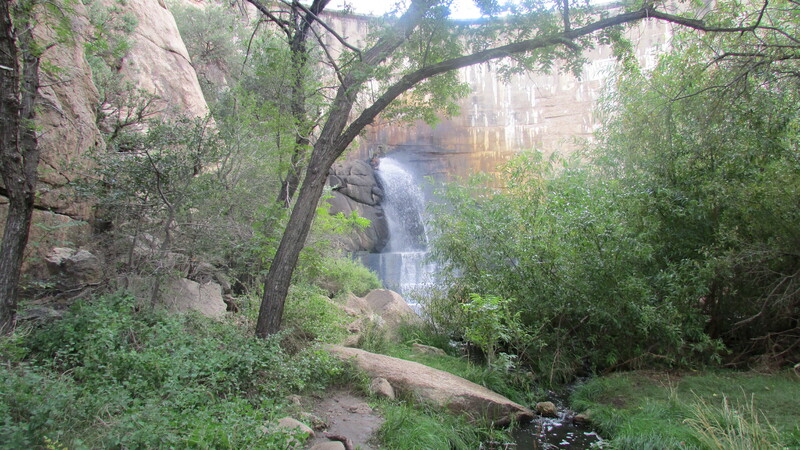 The first set of falls are a two-mile hike from the village. Further down is Moony Falls that is reachable by climbing down from a ledge. For part of the trip down, hikers pass through tunnels and at other times use spikes driven into the walls. The spectacular falls is certainly worth the effort. Leaving Havasupai Canyon, our next stop was the Grand Canyon, where we camped in a tent. We found plenty to do, like ranger talks, hikes and the west rim drive. Our last stop was Oak Creek Canyon and Slide Rock. There I wore out my very best cut-offs sliding down through the pools of water. This didn’t make my mother too happy when I returned home, but it was worth it. A few of our many experiences, in Miss Diehl’s Grand Canyon play school. We took a trip into the Canyon. The Indians were so very kind. We had lots of fun riding horses, but oh my poor behind. There’s reading and resting and meditating, and of course letter-writing too. Last night we had stew for our supper; for breakfast we had stew again. Today will have stew for our dinner. I’m ready to jump off the rim. When I get home to my mother, I know what I’m going to do. I’ll eat and I’ll drink and be merry, for Miss Diehl I’m going to sue. Today is my granddaughter, Brenna’s birthday–she’s eighteen years old–Yikes! It seems like only yesterday that we were meeting her for the first time when we took her brother, Christopher to the hospital. Christopher, who was two and a half, was anxious to get to the hospital, but his first few moments with Brenna showed he had some doubts about this new family member. Being a grandmother has been the source of some of my greatest joys in life. Before Christopher was born, I was given a book entitled “Funny, You Don’t Look Like a Grandmother.” It is a fun and engaging book and I related to it very well. The first chapter is about naming grandmother. The author points out that you won’t get to name the baby, but you will be able to choose what the baby calls you. At first consideration, it doesn’t seem that important, but to someone used to calling an old person grandma, it is cause for concern. I wasn’t sure how I would feel about being called grandma, but I didn’t especially like any of the alternatives either. Of course, it would be some time before that would actually be a concern. And what I learned is you don’t name yourself, your grandchild decides what you will be called. At first Chris called me “Ama.” Because my niece still calls my mother “Bema,” I figured that would be my name from then on. But by the time Brenna was old enough to talk, I was Grandma and my husband was Papa. We have carried those titles proudly ever since. I have cherished every moment I have been fortunate to spend with my grandchildren, and look forward to any time I have with them. When my grandchildren are staying with us, I put everything else aside and spend my time with them. That time is too precious to waste on housework or other chores that can wait. There are better things to do, like hide and seek, or dress-up. I had a box full of bead necklaces. One of our favorite things to do was to hang them from the ceiling fan. Then we would turn on the fan and hide under a blanket while the beads flew around the room. It was great fun! At one of their birthday parties, as they opened gift after gift, I came up with a idea. For the next birthday, we would spend a day with that grandchild. At first it was a day–a trip to the Phoenix Zoo, or a movie. Eventually, it grew into a short trip. We traveled to Tucson to see Kartchner Caverns and Old Tucson. We even hiked to the bottom of Havasupai Canyon. The gifts we have given them are long gone–broken, out grown. But the memories of the times we’ve spent with our grandchildren will be with them forever. To understand the people who once walked these halls. I find the beginnings of the love I have inherited. 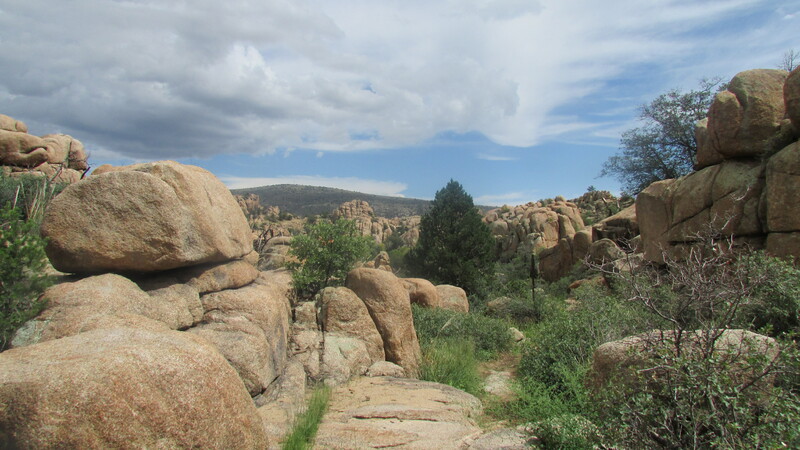 I love hiking in Prescott, Arizona. As a native Arizonan, I’ve done plenty of hiking. I’ve been to the top of Picacho Peak and Piestewa Peak. I’ve been to the bottom of the Grand Canyon and Havasupai Canyon. But there is no better place to hike than Prescott. With over 80 miles of hiking trails and more being added, I could never run out of places to hike. Except for July and August, Prescott has the perfect hiking weather. Even in the summer, the monsoon rains can cool things off enough for an early morning hike. My husband Craig and I were introduced to hiking in 2008, when the Highland Center started the hiking spree. We picked up a flyer and decided to try it. When we finished the hiking spree, we just kept on hiking–all through the winter and the spring. We’ve done the hiking spree every year since and continue to hike year round. 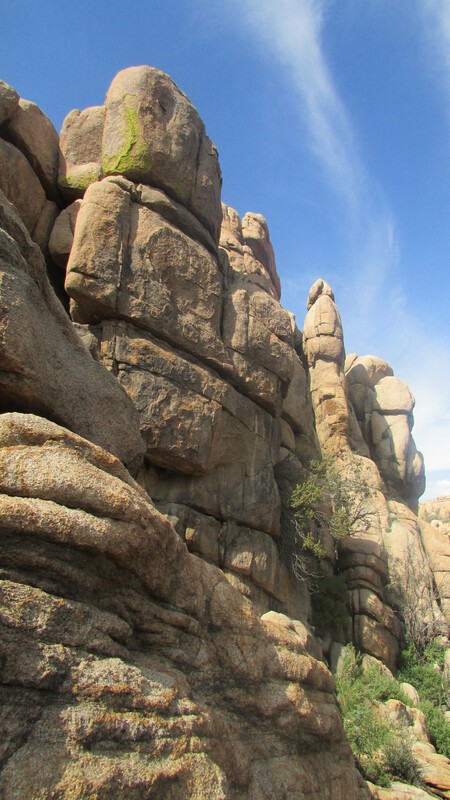 The hike pictured above is the Watson Dam/ Flume Trail in the spectacular Granite Dells. It’s amazing the wonders contained in only one and a half miles of trail. 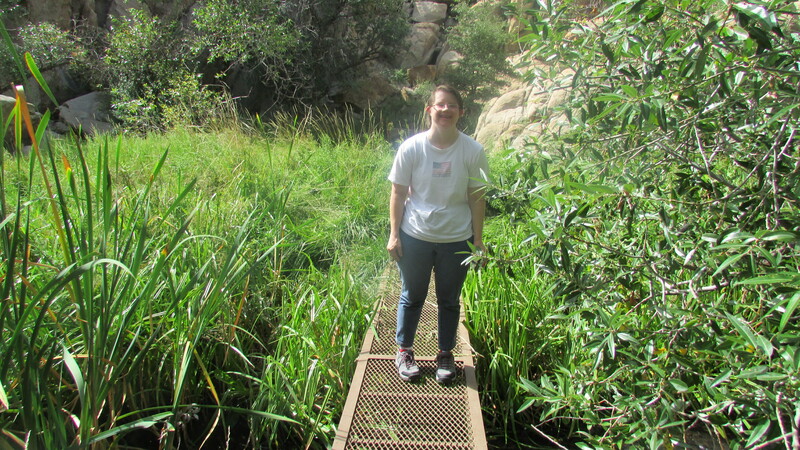 The hike begins with a narrow passage through huge granite boulders. It follows a ledge above a dry creek bed before suddenly plunging down into a small valley. Private property abuts both sides of the trail and homes can be seen through the trees. Reaching the loop portion of the trail, we usually go to the right, up into the rocks. Here the trail crosses solid granite. It is marked by blotches of white paint. Following the markings sometimes requires walking like a mountain goat up the slanted rock face. Vegetation is sparse consisting only of a few scrawny trees that dare to germinate in the crushed granite within the cracks of the rocks. Continuing over the top the trail goes steeply down where everything suddenly changes. Now the landscape is lush with greenery. The narrow moss-covered flume is bordered by tall reeds. We follow the flume to the right and cross a narrow metal foot bridge. The roar of a waterfall can be heard. As we continue on, the back side of Watson Dam comes into view. A huge spray of water is gushing from the dam. The water pools below the dam among the flat granite walkways. Gigantic granite formations, at least three stories high surround the area. We explore the many pools, watching dragonflies skitter across the water. Then we return to the flume and continue along the trail to the left as it climbs up a steep cliff above the flume. Wooden bridges provide passage across deep narrow gorges. Continuing on we see Granite Creek below us. The water babbles as it rolls over rocks in its path. Both sides of the creek are lined with trees. As the creek bends to the east, we travel west until we reach the end of the loop. Back across the meadow, we climb up along the dry creek bed. Soon we are squeezing through the rock entry leaving behind the magical world it hides.